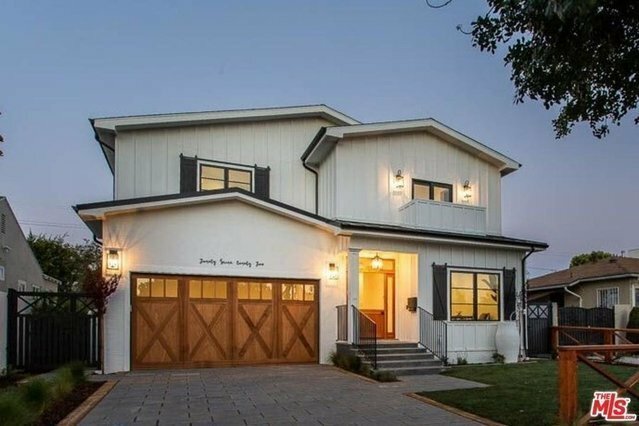 Come home to this beautiful, newly rebuilt farmhouse beaming with character in the heart of West LA. Relish your favorite meals in the gourmet kitchen with honed Carrera quartz counters & backsplash. Wolf stainless steel appliances, SubZero fridge, farmhouse sink, eat-in center island all seamlessly flows to the dining space. Accented by built-ins, fireplace with reclaimed barn wood mantle and accordion doors allowing for an indoor/outdoor feel. Unwind in the master suite with vaulted ceilings, warm fireplace, grand walk-in closet and bath with dual sink vanity, make-up vanity, soaker tub and glass shower. An entertainer's dream, the expansive yard features Bluestone BBQ slab & firepit, romantic cafe lighting, built-in seating and ample space for dining or lounging al fresco. Additional features include sophisticated guest rooms, wide plank naturally aged oak floors, Millard windows & doors, surround sound speakers, doorbell with cameras & motion detectors, electric car charger & more!